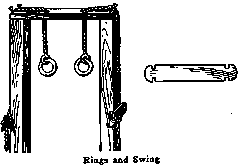 This trapeze, with rings for the large boys and a swing for the smaller ones, can be made on the same standards. Instead of the usual two short ropes, tied and bolted through the top crosstimber bore two holes large enough for the ropes to pass through easily. Pass the rope along the crosspiece and down the post and tie it to cleats nailed at a height that can be easily reached. At the ends of the crosspiece drive two nails, allowing to project 1 or 2 in. This will keep the rope from slipping off when the rings and swing are raised and lowered. All sharp edges should be sandpapered to prevent the rope from being cut. A board with notches cut in the ends will make a good swing board which can be removed instantly. --Contributed by W. A. Jaquythe, Richmond, Cal.